We were intrigued when we were recently invited by the delightful Hana Čičić of Vinart, to the Grand Cro event at Bokeria in Split. So what is the Grand Cro association? It brings together some of Croatia’s premier wine producers. The members are Baković from Brač, Bibich from Plastovo, Boškinac from Pag, Duboković from Jelsa on Hvar, Galić from Kutjevo, Meneghetti from Istria, Petrač from Zagorje, and Saints Hills from Pelješac. The association has been working for several years on elevating awareness of Croatia as a quality wine producer and a great eno-gastro destination. 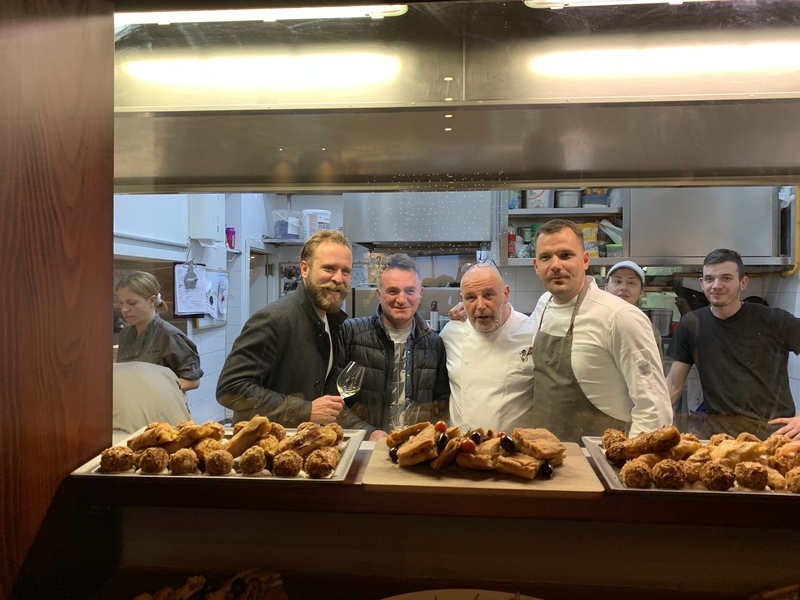 The evening at the lovely Bokeria restaurant in Split was to be a showcase of the best wines from the Grand Cro members, paired with culinary temptations by one of the top Croatian chefs, Hrvoje Zirojević. In season Hrvoje is Chef du Cuisine at Laganini on Palmižana near Hvar, and we have written about him and his skills before. The evening clearly sounded very promising and we gladly accepted the invitation. Vinart are a leading marketing and promotional agency focusing in particular on Croatian wine, nationally and internationally. Founded by Saša Špiranec, and known for their Vinart Grand Tastings in Zagreb in early March, they also organize and run events, do marketing and branding campaigns, and all kinds of related promotional activities. A quality evening at a quality restaurant was on the cards. Especially as the attendees sounded like the Who is Who of the Croatian wine scene. To say that we were not disappointed would be a massive understatement. When we got there, the Grand Cro wineries all had their wines out and ready for tasting. Most of them had the winemakers there to discuss their products. A range of canapes was waiting for us, particularly memorable was a kind of bakalar, or codfish, strudel. Flaky filo pastry pillows containing a filling of traditional seasonal codfish stew. Heavenly. Went down really well with a glass of Bibich Brut bubbly. Of course it also had to be tried with the other two sparklers on show, the Petrač Bregh and the Meneghetti Brut Classic. Soon it was time to take our seats and the meal proper started. I won’t bore you with the detailed description of each wine and dish. Suffice it to say that the pairings worked really, really well. In an interesting twist, each course came bracketed with two wines, one served before and the other after, the food dish. That way we could discover how the first wine influenced the taste of the food, and how the food affected the second wine. Each wine selection was introduced by Saša Špiranec, and then Hrvoje Zirojević described the dish or dishes that were paired with the wines. At the end a set of deserts were produced, and the lovely Prvi Poljubac (First Kiss) sweet dessert wine from Duboković went very well with them. A really well organised and run event. Grand Cro association obtained funding from the EU for their promotional campaign, “Grand CRO Premium Wine Estates” of which this wine pairing dinner was the final act. The project’s goal,was to introduce new markets, increase the recognition of top Croatian wines and winemakers in Europe and the world, and increase market share and the export of Croatian wines. Included in the project were market analyses, developing and export strategy, production of promotional materials, six information events, and four collective appearances at international fairs in Austria, Gemany, Switzerland, and Poland. A total project budget of over 7 million kunas, 90% funded by the EU. A great example of how to compete for EU funds successfully, and then use the funding well.